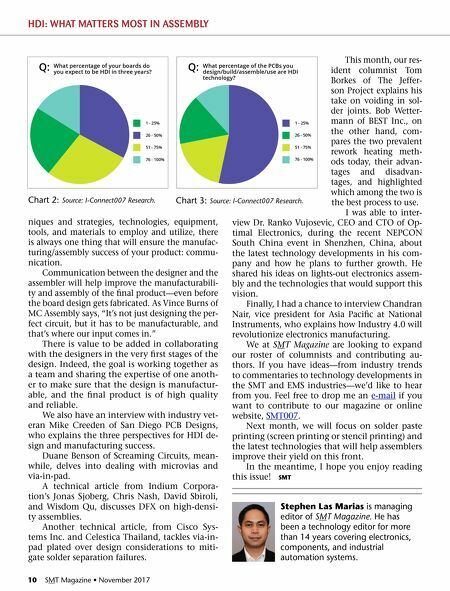 10 SMT Magazine • November 2017 niques and strategies, technologies, equipment, tools, and materials to employ and utilize, there is always one thing that will ensure the manufac- turing/assembly success of your product: commu- nication. Communication between the designer and the assembler will help improve the manufacturabili- ty and assembly of the final product—even before the board design gets fabricated. As Vince Burns of MC Assembly says, "It's not just designing the per- fect circuit, but it has to be manufacturable, and that' s where our input comes in." There is value to be added in collaborating with the designers in the very first stages of the design. Indeed, the goal is working together as a team and sharing the expertise of one anoth - er to make sure that the design is manufactur- able, and the final product is of high quality and reliable. We also have an interview with industry vet- eran Mike Creeden of San Diego PCB Designs, who explains the three perspectives for HDI de- sign and manufacturing success. Duane Benson of Screaming Circuits, mean- while, delves into dealing with microvias and via-in-pad. A technical article from Indium Corpora- tion's Jonas Sjoberg, Chris Nash, David Sbiroli, and Wisdom Qu, discusses DFX on high-densi- ty assemblies. Another technical article, from Cisco Sys- tems Inc. and Celestica Thailand, tackles via-in- pad plated over design considerations to miti- gate solder separation failures. This month, our res- ident columnist Tom Borkes of The Jeffer- son Project explains his take on voiding in sol- der joints. Bob Wetter- mann of BEST Inc., on the other hand, com- pares the two prevalent rework heating meth- ods today, their advan- tages and disadvan- tages, and highlighted which among the two is the best process to use. I was able to inter- view Dr. Ranko Vujosevic, CEO and CTO of Op- timal Electronics, during the recent NEPCON South China event in Shenzhen, China, about the latest technology developments in his com- pany and how he plans to further growth. He shared his ideas on lights-out electronics assem- bly and the technologies that would support this vision. Finally , I had a chance to interview Chandran Nair, vice president for Asia Pacific at National Instruments, who explains how Industry 4.0 will revolutionize electronics manufacturing. We at SMT Magazine are looking to expand our roster of columnists and contributing au- thors. If you have ideas—from industry trends to commentaries to technology developments in the SMT and EMS industries—we'd like to hear from you. Feel free to drop me an e-mail if you want to contribute to our magazine or online website, SMT007. Next month, we will focus on solder paste printing (screen printing or stencil printing) and the latest technologies that will help assemblers improve their yield on this front. In the meantime, I hope you enjoy reading this issue! SMT Stephen Las Marias is managing editor of SMT Magazine. He has been a technology editor for more than 14 years covering electronics, components, and industrial automation systems. HDI: WHAT MATTERS MOST IN ASSEMBLY 1 - 25% 26 - 50% 51 - 75% 76 - 100% What percentage of your boards do you expect to be HDI in three years? 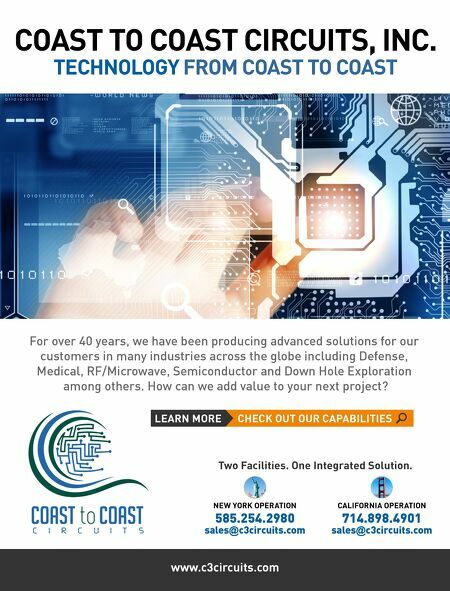 Q: 1 - 25% 26 - 50% 51 - 75% 76 - 100% What percentage of the PCBs you design/build/assemble/use are HDI technology? Q: Chart 2: Source: I-Connect007 Research. Chart 3: Source: I-Connect007 Research.